British Prime Minister Theresa May, currently under siege for her persistent failure to deliver Brexit, praised the arrest of Assange in Parliament today. “In the United Kingdom, nobody is above the law” said May. British Foreign Minister Sajid Javid also praised Ecuadorian officials for their cooperation in handing Assange. “It’s a great day!” said Claude Taylor, a former Clinton staffer who now runs an anti-Trump PAC. Taylor also attacked “enablers” of Assange including Sean Hannity and Nigel Farage, who he alleged visited Assange. Amanda Marcotte, writer for the far-left progressive website Salon said she would enjoy a “dark cackle” at the WikiLeaks publisher being prosecuted. Republican Senator Ben Sasse, who was a vocal opponent of President Trump during the 2016 election, called Assange a “lackey” of Russian President Vladimir Putin. The former President of Ecuador, Rafael Correa, who originally granted Assange asylum in his country’s embassy in London in 2012, came out strongly against his successor’s decision to hand the WikiLeaks publisher over to U.K. police. 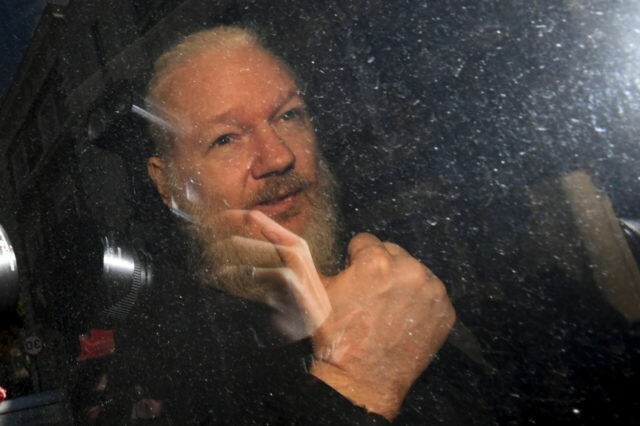 Many Trump supporters expressed similar dismay with the arrest of Assange, calling the publisher a “hero” for WikiLeaks’ efforts to expose wrongdoing by the Hillary Clinton campaign in 2016. “A sad day for whistleblowers everywhere,” said the highest-voted commenter on The_Donald, the center of Trump supporters on Reddit. Populist commentator star Paul Joseph Watson, who has previously appeared on Breitbart News Daily to discuss YouTube censorship, urged Trump to pardon the WikiLeaks publisher. “It’s time to find out whether Trump sides with his base or with the deep state that has been trying to subvert his presidency for the past two years” said Watson. Whistleblower Edward Snowden, who exposed mass-scale surveillance of Americans by James Clapper’s NSA in 2013, tweeted his support for Assange. “This is a dark moment for press freedom,” said Snowden. Snowden also drew attention to a formal UN ruling that the detention of the WikiLeaks publisher was arbitrary and a violation of human rights. Some left-wing journalists criticized progressive media and pro-Clinton figures for cheering the arrest. Glenn Greenwald of The Intercept highlighted a previous investigation into WikiLeaks by the Obama DOJ. Christopher Deloire, executive director of the press advocacy organization Reporters Without Borders said that targeting the WikiLeaks publisher is a “punitive measure” that would set a “dangerous precedent” for journalists. One America News host Jack Posobiec drew attention to the journalism awards received by Julian Assange, and questioned whether the progressives who supported President Obama’s commutation of Chelsea Manning’s sentence would support a pardon for the WikiLeaks publisher. If you supported Barack Obama pardoning Chelsea Manning, do you also support a pardon for Julian Assange? Posobiec, who campaigned for Trump in 2016 prior to entering journalism, also drew attention to the President’s frequent use of WikiLeaks material on the campaign trail. British comedian and free speech champion Mark “Count Dankula” Meecham questioned whether mainstream journalists would support the WikiLeaks publisher. All of the journalists around the world will surely be supporting one of their fellow journalists who is being arrested for doing journalism.